Wyze Cam Review: Does this $20 WiFi Camera Feel Cheap? Smart home technology is known for its high price tags, which is why Wyze Cam stands out. 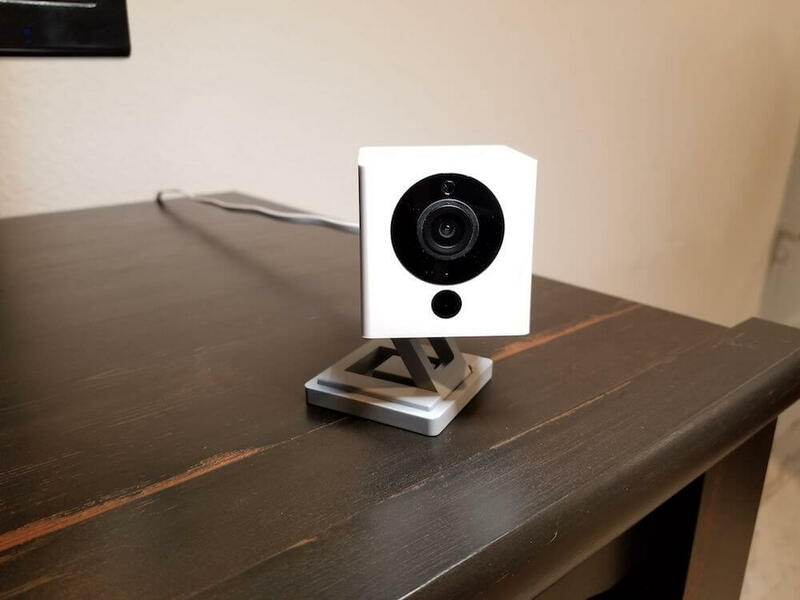 Priced at a jaw-dropping $20, the small WiFi camera is cheap enough to make you wonder “what’s the catch?” This detailed Wyze Cam review will walk you through our testing of the camera’s quality and security. Let’s get started. 1.9 Is Wyze Cam Worth It? Affiliate Disclosure: This page has affiliate links, which earn us commission at no cost to you. The writers of this blog received a free sample for review. They were not compensated in any other way. The opinions are 100% their own and not influenced. For this review, we tested out the Wyze Cam v2. It was designed in Seattle by former Amazon engineers to be the most affordable high-quality WiFi camera on the market. At just $20 (plus shipping), it’s hard to argue with the price since comparable 1080p cameras cost more than $100. Part of the cost-cutting measures are in the packaging: you’ll notice that Wyze comes in a small, simple box with limited, basic packaging. They also sell the cameras at the cheapest price on their own site to avoid paying fees to retailers. Although, once you add in shipping costs, it may make sense to buy it from Amazon so you can take advantage of Amazon’s fast shipping and easy return policy. Wyze Cam is a small enough cube that it can fit in your hand. Its leg on the bottom extends, folds flat, or rotates for a flexible surveillance. It has magnets on the bottom of the leg, allowing you to install it on your fridge. It also comes with a 3M strip and additional wall plate for mounting it to your walls without requiring any screws. It’s definitely plastic, and feels that way. 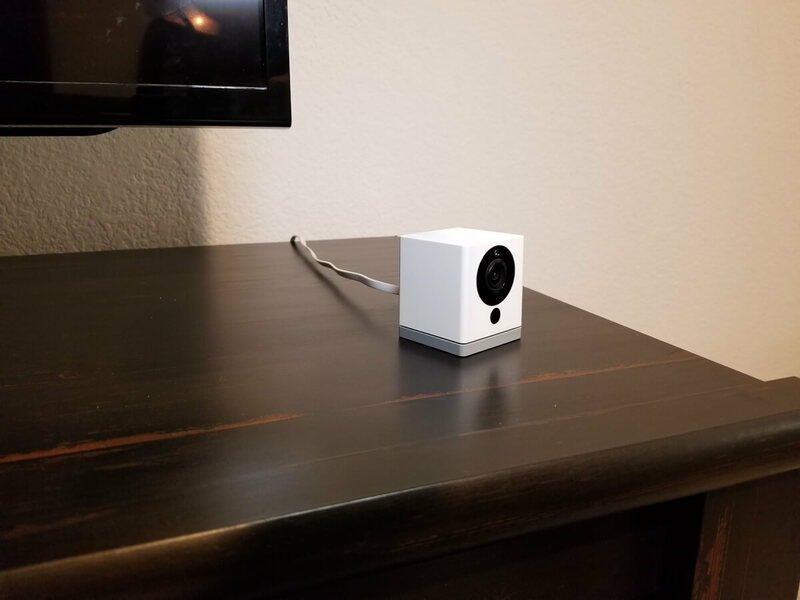 When positioning the camera for this Wyze Cam review, we noticed that if the leg is up then the cord can easily move it since the camera is so light, which can make installation frustrating (although if you fold it into its square shape, this isn’t an issue). However, we’ve tested many WiFi security cameras, and this was on par with its plastic competitors that are at a much higher price point. I was honestly expecting it to feel much cheaper than it does. If you’re not concerned about purchasing a camera with a more basic look, then Wyze could work for you. USB output (cable included). 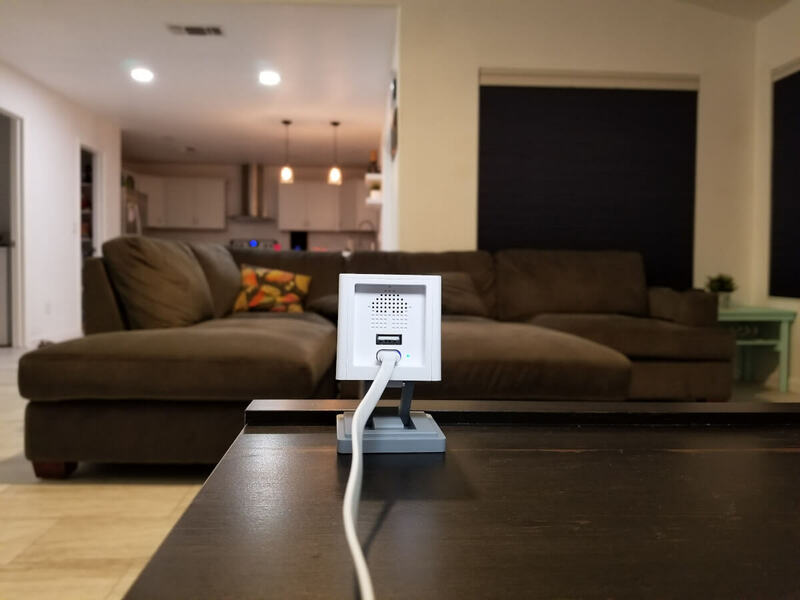 One purpose for this output is that you can connect your Wyze Cam to another Wyze Cam, creating a chain where only the first one is plugged into power. Power adapter. There is no battery option, as this camera needs to be plugged into power (or another camera) to function. Note that Wyze Cam only works on a 2.4 GHz network. Setting up Wyze Cam is simple, and not too different from other WiFi cameras. Simply download the app, plug in the camera, place the QR code that displays in the app in front of the camera, sync with your WiFi, and wait a bit while it connects. We had no problems or hiccups during setup for our Wyze Cam review. 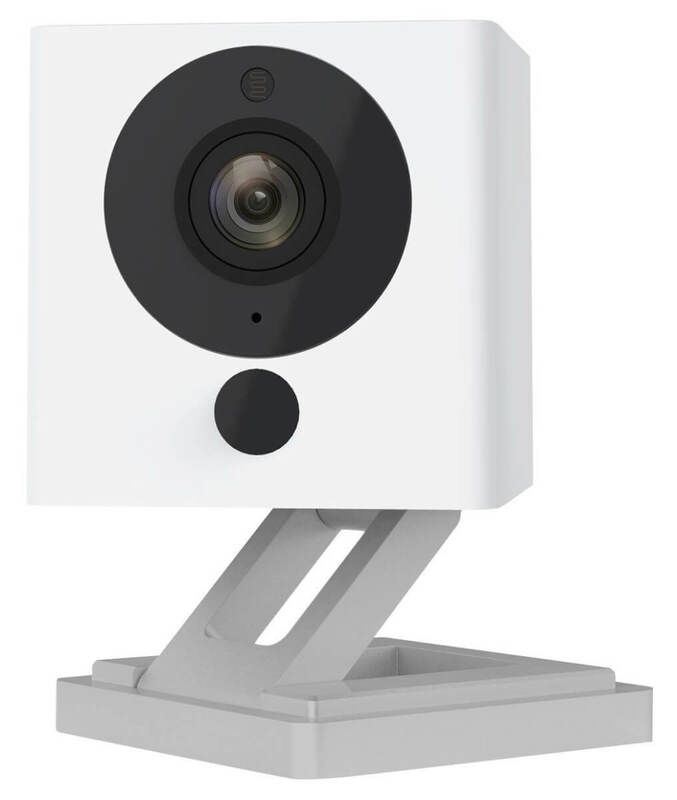 Wyze Cam v2 comes with U.S.-based customer support to assist in setting up your camera if problems arise. Motion detection and tagging. When motion is detected, you can get an alert (see the notifications section of this review for more details). The app also tags motion with a green box around the moving subject’s face, seen on both live and recorded video. This is a nice feature that surprised us in such an inexpensive camera. It helps you quickly see movement when reviewing footage since the box follows the subject. 1080p full HD. This video quality is impressive for just $20. The 1080p on the camera looked clear and high quality in our Wyze Cam review testing. 110º wide angle view. This is wide enough to catch the action you need to see. By comparison, the Nest Cam is 130º, so Nest is only slightly wider even though it’s much more expensive. Night vision. 850nm infrared LEDs are built in for around 30 feet of illumination at night. This can be turned on automatically or manually within the app. 8x digital zoom. Simply pinch and zoom on the live stream or recorded videos. However, this does decrease the quality a bit compared to keeping the image zoomed out. Time lapse videos are available if you want an overview of the day. These are customizable since you specify the start and end times, in addition to how often you want Wyze to take a photo. During our Wyze Cam review testing, we set up a time lapse to see what our dog does all day. If you’re wondering: she sleeps. That’s about it. Motion detection zones. When you turn off the full screen detection in the alert settings, you can crop the section of the screen you want to monitor for motion detection. This avoids false alarms if there are sections of your home that have busy movement that you don’t want monitored. Live stream available in the app. This stream is only delayed by about a half second, which is less than most WiFi cameras. When you open the app, an old image is automatically displayed, but by clicking on that you pull up the live stream. You can easily view the live stream on the app, but currently there is no ability to watch it on your desktop. Wyze says this option should be coming in the future. Many WiFi cameras gouge you with their cloud storage fees, offering very limited functionality on the free plan. Wyze Cam is different, offering 14 days of rolling free cloud storage. Whenever there is motion or sound and your camera is set to record, Wyze records 10-15 second videos and uploads them to the cloud. This is a short length when you think about the average amount of time surveillance is needed; if you only record when people begin walking into the room and stop, then you might miss a lot of the action. After the recording is uploaded, there is a few minute break before motion is recorded again, which can make it difficult to use for security monitoring. This is where the microSD card comes in. The microSD slot makes local storage possible, but it also opens the door for continuous recording for those who prefer that over recording on motion or sound. This assures you that no footage is missed if there are delays after motion is triggered. The microSD card is managed within the app settings, where you can format the card. To use the speaker to talk through your camera, you have to open the Wyze app and hold down the microphone button while speaking. This worked well for our Wyze Cam review, showing that there has been some improvements and updates since the first version of Wyze was released. There is approximately a one second delay, but the microphone is plenty loud and not muffled at all. The microphone on Wyze Cam alerts you when sounds are heard. It records high quality audio that sounds impressive and is easy to understand. Using the speaker and microphone together, you can use Wyze Cam to hold a two-way conversation, allowing you to talk to your kids, pets, or even intruders and hear them reply. The app is available on iOS and Android. It works well, although it can be a little glitchy at times with a few crashes during our Wyze Cam review testing. Even with these small issues, the app was mostly reliable. It has greatly improved since it was first released and continues to update with improvements. Wyze Cam app has more features and options than you would expect. On the main screen, you can easily control the camera by muting the sound, toggling the video footage between SD and HD, recording video, speaking through the speaker, taking a photo, turning motion tagging on/off, viewing the album, and setting up time lapses. The timeline of notifications is easy to navigate. You can view a day-by-day timeline of recorded events for each camera, or for all of your Wyze Cams. When you watch the clips, they are downloaded from Wyze’s cloud storage, giving you the option to share or delete the video from your timeline. Scheduling when you want to receive alerts. You can’t specify the days of the week, but can set the times. So if you only want to receive alerts while you sleep from 11pm to 7am, then that’s an option. You can configure alerts for motion and sound within the app. These are both adjustable, and you can set zones and sensitivity. One of Wyze Cam’s more advanced features is smart sound recognition. If a smoke or CO alarm is ringing, then you will be notified specifically of what it heard. We tested this with a smoke alarm, and Wyze notified us quickly and accurately. This is a nice safety feature that many other WiFi security cameras skip out on. The notifications came in pretty quickly for us as push notifications on our phones during testing for this Wyze Cam review. Security is understandably a big concern for those interested in the Wyze Cam. With its low price, the first thought that probably crossed your mind is “yeah, but is it going to get hacked?” Videos stored in the Wyze cloud are actually uploaded to AWS (Amazon Web Services) Cloud, which is known for its strong security. End-to-end encryption helps upload these videos securely. HTTPS and AES 128-bit encryption protect the data on the camera so that you don’t have to worry about anyone else keeping an eye on your WiFi camera. One issue previously noticed is that Wyze Cam was sending data to IP addresses all over the world. Apparently their load balancers were located worldwide, which was enough to concern users about this affordable camera being a Chinese spy. Since then, Wyze Cam has fixed this and now the data is sent within the United States. Wyze Cam is just as secure as many of the cameras that have more of a big-name brand behind them, and you don’t have to worry about your data transmitting to where it doesn’t belong. Wyze Cam currently has no smart home integrations or IFTTT functionality. That means you can’t get it working with your smart home hubs like SmartThings or Wink, or any other connected devices like Alexa an Google Assistant around your home. This might not be a deal breaker for such an affordable camera, but it’s certainly an opportunity for growth by Wyze in the future. If you want a camera that integrates into your whole smart home setup, you may want to look at spending more money on a higher-end camera like Nest or Canary. Is Wyze Cam Worth It? The short answer for this Wyze Cam review is yes, absolutely Wyze Cam is worth it. At such a low price, you can almost certainly find somewhere in your home to use Wyze Cam, such as in your nursery, entryway, kitchen, or anywhere else. There’s a lot of value packed into this little square camera, making it easy to be satisfied by its lengthy list of features. Wyze Cam is blazing new trails as an ultra-affordable and high quality smart home device. It worked really well in our testing and also has high reviews on Amazon. If you’re looking for an affordable, quality camera to keep an eye on your home, Wyze will be the easiest on your wallet while also protecting your home.